Location: The great delta formed by the mighty Anduin where it flows into the Bay of Belfalas. 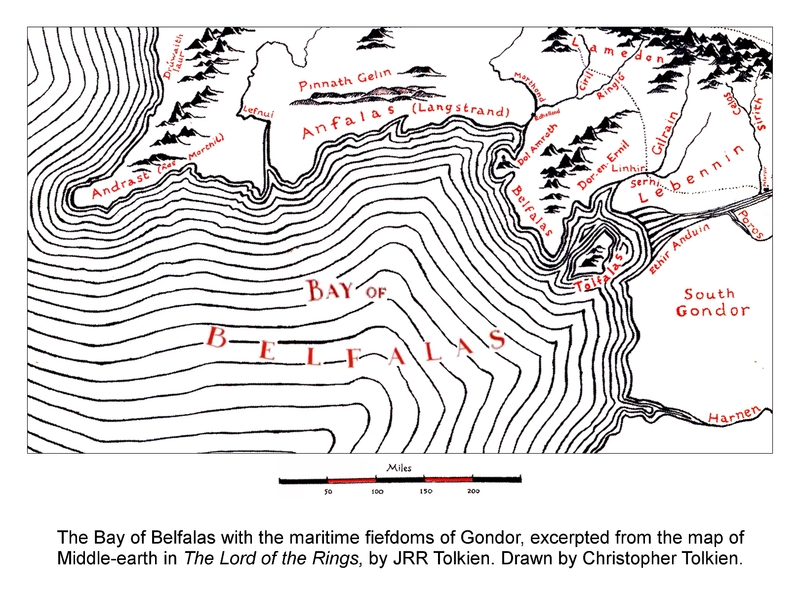 The Gondorian section of the Bay of Belfalas, showing the Mouths of Anduin (Ethir Anduin). Soon [Frodo] came out alone on the summit of Amon Hen, and halted.... Southward he looked.... And Ethir Anduin he saw, the mighty delta of the River, and myriads of sea-birds whirling like a white dust in the sun, and beneath them a green and silver sea, rippling in endless lines. [The shores of Middle-earth] were much changed in the tumult of the winds and seas that followed the Downfall; for in some places the sea rode in upon the land, and in others it piled up new coasts. [The] Bay of Belfalas was much filled at the east and south, so that Pelargir which had been only a few miles from the sea was left far inland, and Anduin carved a new path by many mouths to the Bay. But the Isle of Tolfalas was almost destroyed, and was left at last like a barren and lonely mountain in the water not far from the issue of the River. 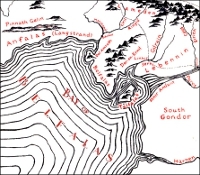 [Ships] approaching Anduin and making for Pelargir went by the eastern side of Tol Falas and took the sea-way passage made by the Númenóreans in the midst of the Delta of Anduin. sîr 'river', from root sir- 'flow', in Ossiriand..., Sirion; also in Sirannon (the 'Gate-stream'...) and Sirith ('a flowing'...).... With change of s to h in the middle of words it is present in Minhiriath 'between the rivers'...; in Nanduhirion 'vale of dim streams'..., and in Ethir Anduin, the outflow or delta of Anduin (from et-sir).